Soul legend and ‘walrus of love’ Barry White has been awarded the 2,506th star in the Hollywood Walk of Fame, 10 years after his death. The late, great singer died in July 2003 and would have been 69 this year. The two-time Grammy award winner passed away from Kidney failure related to his diabetes and blood pressure at the age of 58. 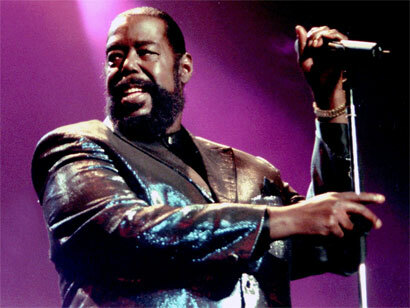 The unmistakeable voice of Barry White produced a string of hits through the 70s including ‘Can’t Get Enough Of Your Love Babe’, ‘You’re The First, The Last, My Everything’, ‘I’m Gonna Love You Just A Little More Baby’, ‘Never Gonna Give You Up’ and his 40-piece Love Unlimited Orchestra’s ‘Love Theme’. Other recording artists who will be awarded stars in 2014 include Holland Dozier Holland, Jeff Lynne, Mana, Ray Parker Jr., Katy Perry, Rick Springfield and Tupac Amaru Shakur (posthumous).